Dodgers Blue Heaven: Thanks for Staying Blue, Kenley Jansen! Dodger fans can finally rejoice. 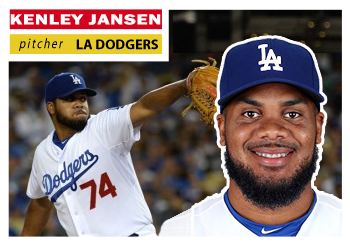 Per various reports, particularly a tweet by Jim Bowden, the Dodgers have apparently agreed to terms with free agent closer and the teams all-time saves leader Kenley Jansen to a long-term deal. Jansen and Dodgers agree on 5yr $80m deal according to Dodgers source confirmed. 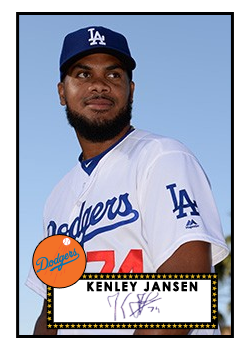 When the Dodgers left the Winter Meetings last week, a sense of pessimism pervaded their negotiations with closer Kenley Jansen. He was reportedly weighing a five-year, $80-million offer from Miami, and it was unclear if the Dodgers would match it. The weekend provided an answer. The Dodgers have reached an agreement with Jansen on those same terms, according to people familiar with the situation. The people requested anonymity because the contract was not finalized. Obviously, this has yet to be confirmed; nevertheless, I'm gonna celebrate anyway. In honor of his soon-to-be signing I made the above two fantasy Baseball cards of him. At the very top is a 1956 Topps Baseball card design with a photograph originally taken by Jon SooHoo/LA Dodgers 2015. On the above right is a 1952 Topps card design with another pic by Jon SooHoo/LA Dodgers 2016.